I just completed week six's arrangement for my floral design class. I had chosen a pink and white color palette of lilies, ranunculus, tulips, snapdragons, and baby roses when I picked out my flowers yesterday at Trader Joe's. Once in class, our instructor pulled out the surplus of flowers she had in the fridges and said we could use whatever we liked. 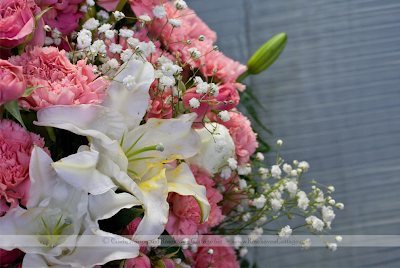 I chose the pink carnations and million star (often mistaken for baby's breath) as well as the basic leather leaf fern for filler. Last week we were told that we would be doing an Easter arrangement in a basket of some sort that we were to provide. I had noticed others asking the instructor about less traditional baskets and thought my square basket would do nicely even though most people were going to use traditional low and oblong Easter basket (I didn't have one). With the oblong baskets half would be flowers and half would be filled a stuffed animal and other Easter decor. We have a packet of sample photographs for each week, and I saw that not all of them for this week had a stuffed animal in it, so I thought I'd be okay without one. Once in class, when our instructor told us we were free to arrange things however we wanted for this one, I figured I'd be okay. One rule we needed to follow was that our arrangement was to be 1 1/2 times the height of our basket or the width of our basket, whichever was larger. I got going purposefully making a one-sided arrangement so it would fit on our fireplace mantle once I got it home. Since we were being allowed to do whatever we wanted, I started playing with the idea of creating an "S" curve from top to bottom through the center of the arrangement with the lilies and snapdragons. 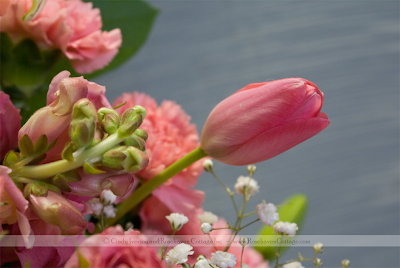 Then I thought it would be interesting to use the pink carnations as filler instead of green leather leaf so the lilies would stand out on a background of pink instead of green. I was feeling really good about the arrangement as it grew. The more flowers I got in it, the more I liked it. My classmates were giving me compliments too, so I figured I was doing good. My instructor stayed pretty quiet. I figured it was because she was helping others and also doing her own arrangement. When I got done, she came over to look at mine. She commented that it was definitely an "en masse" arrangement. Right then, I knew that she didn't like it. She made a few more comments about how she was going to teach me to do arrangements other than "en masse" ones. Then I really knew she didn't like it. I felt like a heel. Everyone else was being a good follower, using the right shaped basket with the stuffed animal, and I was sitting there with an arrangement that was clearly not what she had wanted us to do. I felt like it had been a secret test, and I had failed miserably. And being a classic "people pleaser" that needs assurance from authority figures makes the whole thing smart even more. The sad part is, it's a beautiful arrangement. I'm certain that if it was for sale in a shop, there would be someone that would fall in love with it and buy it. I could probably sell more than one like this. The other sad part is, I love en masse arrangements that have little or no greenery. I love bouquets without greenery. I love photographs of flowers en masse without greenery. I love the repetition of colors and forms. It pleases my aesthetic. But it seems that my aesthetic is in direct contrast to my instructor's aesthetic. This is a repeated theme in my life. In many creative classroom settings in the past, I've ended up being the "black sheep" whether I intended to or not. I really wanted this time to be different. I really wanted to conform and be the "good student" for once. I'm really going to try, but somehow I think I've already been labeled as the "problem child". 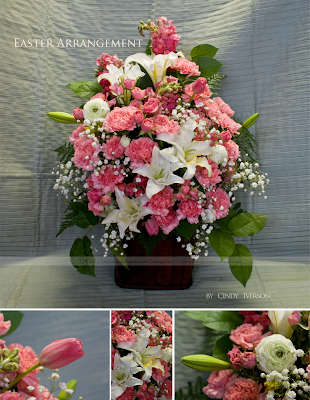 Cindi, I think your arrangement is absolutely stunning! So there instructor!! Ok, number one: she wasn't clear in her instructions and only said to use a basket. Number two: she's an instructor, not a world renown expert. Number three: I think it's gorgeous. And I think that flower arranging is an art. And, as you well know, art is subjective. Much like literature. What one person loves and adores, another doesn't. We've all seen paintings, or read books that we really didn't care for, but which were lauded as amazing or groundbreaking by others. I'm not a big fan of Picasso, but to others his works are incredibly visual and strikingly realistic. I appreciate him as an artist, but won't hang him in my home. I, as you know, much prefer Monet or Michelangelo or Raphael. Cindy, I know for a fact that you will find that some of your best creations in life have come from the fact that you DIDN'T conform to what everyone else was doing. You went with your instincts and now, like then, you've created something beautiful. It's something you will enjoy, in your home. It should stay in your portfolio. So that, in the future, when someone else comes to you and wants an arrangement done "en masse", you will be able to create something beautiful, just for them. Don't conform, just to please an instructor. You're much too strong and vibrant to ever let go of your instincts. Trust them. Oh I LOVE it! I think you are an "outside the box" thinker.....and very creative at that! We all must dance to the beat of our own drum I say. Cindy, Was to goal to have everyone do the same cutesy stuffed animal thing or to be creative. I think she needs to be a little more clear on her objectives. If she was teaching how to make an arrangement with a stuffed animal, well you didn't do that. If she was teaching making a lovely easter arrangement, then you went above and beyond. Could she be a little intimidated by your talent? Whatever! It is a delicious arrangement! I understand the feeling that "my taste is different than other's" and somehow feeling that this is wrong. Well, to HECK with it! It is OKAY that you are different Miss Cindy! Apparently it runs in the family because I have yet to meet someone with the same taste as me. Frustrating to have a different eye, but DO NOT doubt yours, it is flawless. Just listen and learn and try in your class...and add what works to your arsenal...and don't stress if it's not your thing. You are an amazing artist! In anything creative you take on! Cindy... I love you... just be yourself! I'm so tired of seeing tried & true arrangements of any sort, those one hit wonders that keep showing up every season. Ugh...enough already, somebody show some creativity. And, flower arrangements with stuffed animals in them, don't do it for me. Never have. I think they're too saccharine. Your teacher probably wants to establish the basics with you. You know, learn what the rules are, so you can break them later. I love your arrangement too. I think that you should be allowed to be creative and not just make something to please your instructor. It's a good thing your instructor will never see my garden: en masse flowers, baby, and it rocks! Cindy, I do agree with all the comments above, especially Holly's number two. Obviously the instructor knows she can't teach you anything about "en masse" arrangements. An arrangement is only good if it fits it purpose - your fireplace. Did she understand it was for a purpose! I think you will end up with a wider portfollio than a student that only does the arrangement the instructuor is good at! I hope this doesn't spoil the pleasure that the arrangement gives you, it is beautiful. Cindy - your arrangement looks great. You made what you wanted and was pleasing to YOUR eye not the instructors. I understand your frustation as I was not a good student - but Cindy this is art right. Art is different to each of us and we each express in different ways. Yours is beautiful like it is. Yesterday was "no blog day" for me so I missed this post but I saw your comment on facebook and felt bad about it for you. It made me think how much the opinion of someone we didn't know from Adam only a short time ago can make such a huge negative impact on our life. It seems pretty silly actually--even though I do it too. Then I read this post and realized it is about a whole lot more than the opinion of one flower arranging teacher. Let me just say--if you want to be a true artist, you shouldn't be the good student or the follower. Learning the rules are important but seeing just how to break them and come up with something even better is essential. You are an artist. First of all, I am smitten by your originality and creativity that's all over your blog, no matter what anyone else says. Secondly, I love your en masse arrangement! Thirdly, I can relate to the 'not fitting in' feeling. I can also encourage you that I am learning that other people's 'opinions' of us are often not as accurate as we give them credit for. Even if that's not what she wanted for your class arrangement, don't take it for your whole life! And besides, why shouldn't your feeling of joy in your creation not count as much as anyone else's, even if it is different. Other may have labeled you a 'problem child' in the past. My heart says, you aren't a child anymore, there's no need to identify with that label in the present or the future. I'd love to share a new identity with you -- one who has the originality and design God placed within her even before the world began! And when you live and walk in that originality, it is good. Even as the Garden of Eden was called good! There's my two cents worth! I think your arrangement is very beautiful. Personally I wouldn't give an arrangement with a stuffed animal in it house room. Cindy, I too was rushed yesterday, and I did not read your post through. I skimmed and looked at the gorgeous photos. And Gorgeous they are. Frankly my dear, I agree with Holly. She has said it very well. And I love the arrangement. IT has been a busy week during SPring Break. I am so happy I came back to read your post. BEAUTIFUL!!!! Happy Easter to you and your family Cindy. 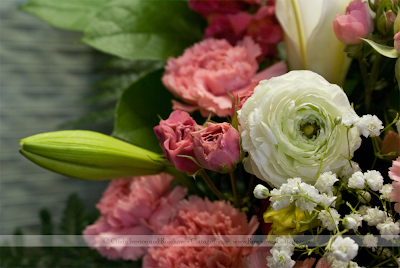 It is for certain I've fallen in love with your flower arrangement! I happen to really like your S-arrangement, and I love the color choices.